As she herself admits, hers has not been a "normal" life. 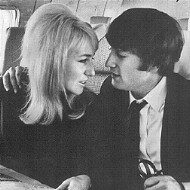 As the first wife of John Lennon, Cynthia Lennon lived the Beatles' story in a way no one else could, and she has some amazing experiences to look back on, not all of them good. 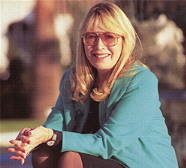 One very good outcome of her marriage is her son Julian, who has inherited his father's talent. But in more material terms, almost everything John had to leave went to his second wife Yoko Ono. Julian and Yoko are currently trying to work out some amicable arrangement over the multi-million pound estate. 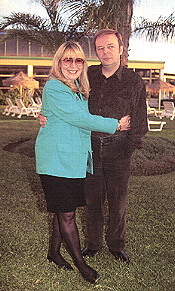 Cynthia, who has married three time, gave this interview while on holiday in Marbella, Spain with her companion of the last 14 years, Jim Christie. Cynthia, what are you up to these days? "I'm taking part in a touring show about the life of The Beatles, called A Little Help From Their Friends. It's the first time I've been on stage in my life; a do a kind of prologue, an introduction. It's on tour in different theatres across Britain." Did being John Lennon's wife affect the whole of your life? "Oh yes. It's difficult to say just how, because it's a two-edged sword; sometimes it's very good for me and at other times it's bad." "Well, if you think about the life I had with John, there was a very public divorce, then there was his horrendous death, and then there's my son, whom I want to protect, so it's not been a normal life." How long were you with John? "A whole decade; four years going out together and six years of marriage." Which part of the Beatles' era did you live? "All of it really, from its birth up to its worldwide success. Right next to the art college where John and I studied was the school Paul McCartney and George Harrison went to. They were so young that they wore shorts and ties and schoolboy caps then. They used to come into our college and we'd sit around eating fish and chips and playing the guitar together." Did Julian keep in touch with his father after you and John divorced? "No, just after we seperated John went yo live in America for four years, with Yoko Ono. We didn't hear from him at all during that time, nothing. "So I took Juilan to America so that he could get to know his father properly, and that's how we began to talk again. John couldn't handle the confrontation or the guilt. It did both of us good to talk again, and of course it was important for Julian because after that he could go stay with his father and they got close then." Does Julian keep in touch with Sean, Yoko Ono's son? "Yes, but not that much because Sean and Yoko live in New York and Julian's in Monaco now. They talk on the phone from time to time." "He does all kinds of things; he's a musician, he's opening a restaurant in San Francisco, he's making a film about dolphins, and so on. He's also done a song for the film Mr Holland's Opus, starring Richard Dreyfuss, who is up for an Oscar. And apart from that, he's a really nice boy." Do you belong to any pacifist or ecologist organisations? You went to India with John and practiced fasting and relaxation. "My whole attitude to life is pacifist, I don't need to be part of any organisation. I was already a peaceful person before going to India and afterwards, I didn't feel the trip had taught me anything about being peaceful that I didn't know beforehand, although it was a very interesting experiance. "I believe that you should treat others the way you'd like them to treat you, and that to me is all that matters." Do you keep in touch with the rest of The Beatles? "Yes, but only occasionally. We'll talk on the phone or something, say hello and goodbye." Is it true that is was Julian who gave the song Lucy In The Sky With Diamonds its title? "Yes, when he was very small, four years old, he had a little girlfriend called Lucy, and one day he came home with a drawing - he used to draw a lot - of Lucy in the sky with diamonds. And John said, great, wonderful!" What do you think of The Beatles Anthology? "It's very good. And it's interesting to hear John singing a couple of old demo tapes on the new album." And have you heard about the Liverpool Institute for Performing Arts that Paul McCartney set up? "Yes, it's an excellent idea. It's to teach music and dance. To be in the situation where you can do that, buy up your old school and give something back to Liverpool, is great. Giving is always important." Did you feel like you'd lost something of your own when John was killed? "Yes, millions of people did. For me, the most tragic aspect was that my son lost his father." Isn't it tragic too that it's Yoko who will decide about whether or not Julian will inherit some of his father's estate? "When we're born nobody says life is going to be beautiful. Life is always very difficult and it's wonderful sometimes and sometimes it's terrible. But in my heart, I believe in justice, and one day justice will be done. For me, the justice is that I've got a wonderful son, who's my best friend, so forget the money because it's not as important as that." Have you ever confronted Yoko Ono? "No, never, the only thing we have in common is that we married the same man. She's a conceptual artist and I'm a realistic artist." What has your son inherited from his father as a person? "It's strange, the older he gets the more he looks like my side of the family, but he does have one gift from his father, and that's the talent to create, to write and compose. But I studied art , too, and I think he has things from both of us." Are you happy in your relationship with Jim? "Yes, Jim and I have been together for 14 years and we're doing fine."